Massif Press is proud to announce Lancer, a tabletop roleplaying game set in the far future, centered on mechs and the pilots who crew them. A new setting developed by Tom Parkinson Morgan and Miguel Lopez, Lancer imagines a future where a survivor humanity has spread to the stars after weathering terrible ecological collapse on Earth -- the end of the Anthropocene as a consequence of unrestrained consumption and poor stewardship. Lancer features a mix of gritty, mud-and-lasers military science fiction and mythic science fantasy. In the setting, conscript pilots mix ranks with flying aces, mercenary guns-for-hire brawl with secretive corpostate agents, and relativistic paladins cross thermal lances with causality-breaking, unknowable beings. Players of Lancer adopt the roles of mechanized chassis pilots -- mech pilots -- comrades together in a galaxy of danger and hope. Some groups will fight for Union, working to rectify the crimes of previous administrations. Others, for a corpro-state, working to advance private interests while lining their pockets. Others still will fight for groups acting in opposition to those in power, or for themselves. 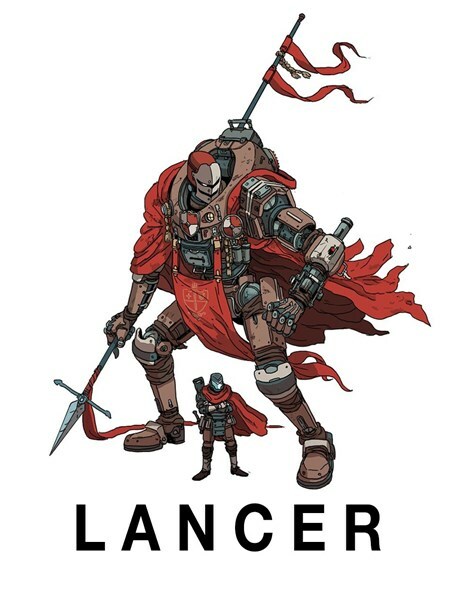 Lancer is the second TTRPG from Tom Parkinson Morgan, creator of Kill Six Billion Demons and Broken Worlds, and Miguel Lopez, a fiction writer based out of Portland, Oregon. Massif Press is a new publisher of games and zines; Lancer will be its first offering. We’ll be launching a Kickstarter campaign on April 8th, 2019, to cover the cost of editing, layout, art, and — potentially — an initial print run. We plan to always keep a version of Lancer free and available online via multiple outlets: Drive Thru RPG, Itch.io, and Massif Press’s public-facing Dropbox. Our text (estimate, prior to final layout and edit) is 560 pages long. We expect to retail our PDF for $30.00 USD, and our hardback (A4, a copy of the PDF included) for $60.00 USD.